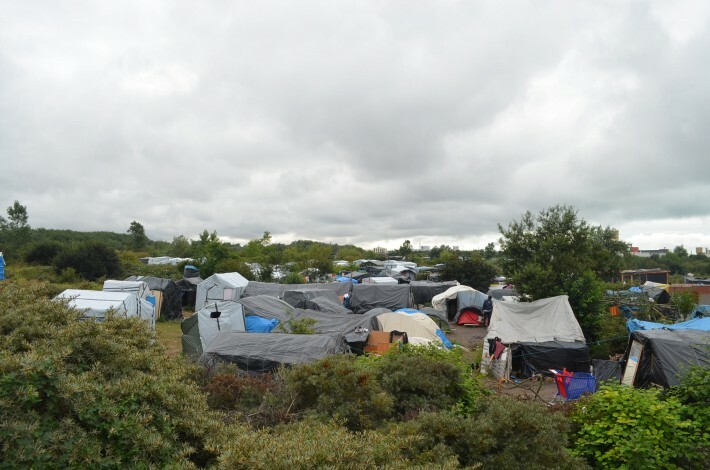 Roger Tagholm visits the “Jungle” migrant camp in Calais, France and reports a new library has been established, but still needs many books. 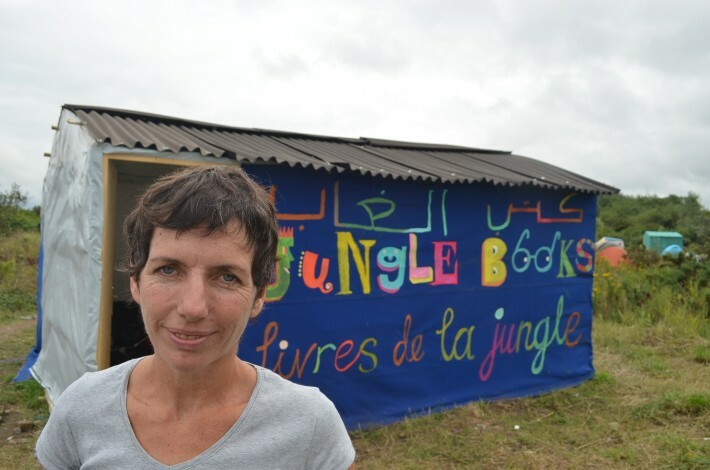 A makeshift library has just opened in the “Jungle” migrant camp in Calais, northern France. Called “Jungle Books” — well, what else? — it is supplied by voluntary donations and staffed by a stream of volunteers sympathetic to the plight of the refugees whose stories continue to dominate the news right across Europe. So far it stocks fiction and children’s books, dictionaries, reference books and business titles, and acts as a support to the camp’s school where a regular, daily timetable of classes is now underway. 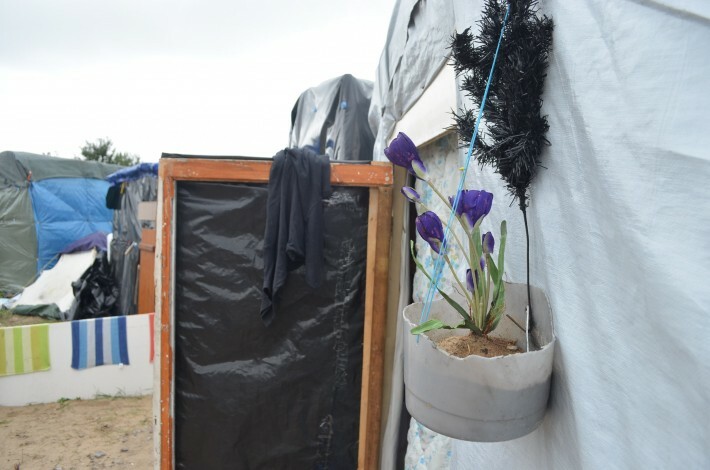 It is the inspiration of British teacher Mary Jones — originally from Wales, now living in Amiens — who has been bringing items to the camp for years, but wanted to do something more. “Ever since the previous centre at Sangatte closed years ago, I’ve been keeping an eye on the situation here, bringing things when I could. I wanted to start something that offered real, practical help. Many people here are well-educated — they want to get on and they want books that will help them read and write English, apply for jobs, fill-in forms. 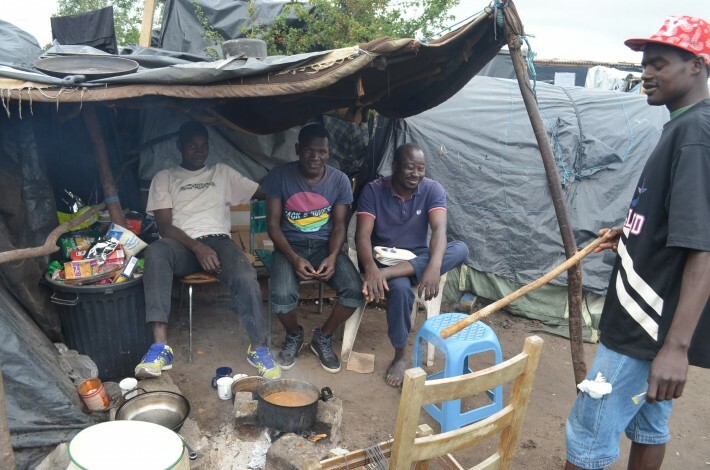 The camp, nicknamed the “Jungle” by its floating population of refugees, asylum seekers and those simply seeking a better life, sprawls across low scrubland adjacent to the main road leading to the ferry terminal. It is here that migrants can be seen openly walking up the grass bank to the road when traffic slows and there is a chance of hiding in a UK-bound lorry. There is a more or less permanent presence of French police here, playing a continuous game of cat-and-mouse with the migrants. The “Jungle” is so long established that it is beginning to be a microcosm of the outside world. Thus there are two churches, a mosque, numerous grocery stores, a handful of little restaurants, a bar, an outdoor barbers, a charging station for mobiles, a bike repair shop, a school and now, a library. 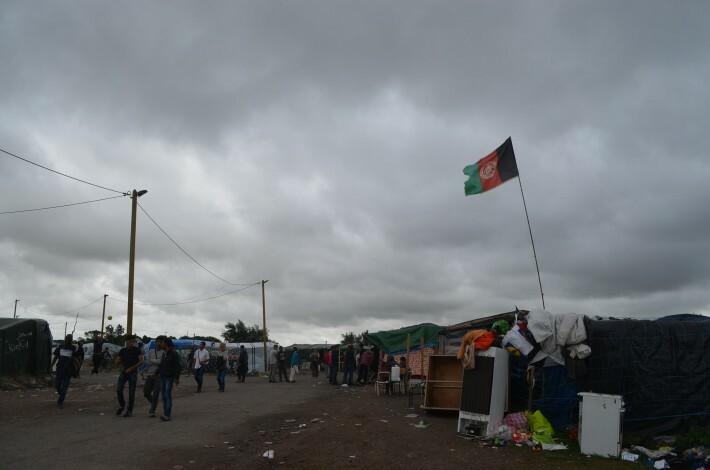 It is divided up by nationality and language — Afghanistan, Syria, Sudan, Eritrea, Iraq — sometimes with each country’s flag fluttering high above the shacks. To wander its muddy lanes and snaking paths is to take a journey through some of the world’s trouble zones, though here the welcome is warm. “Bonjour,” “Hello,” “How are you?” people say as you pass. The Afghan flag gives a sense of home. The place is hugely industrious, with all manner of construction, cooking and domestic cleaning taking place. One household had cut a plastic water container in half to make a plant pot and had nailed it to the wall and was growing flowers in it. Another was using an old sink as a boot-washing station. Little clusters of washed shoes suspended on tall sticks to dry are a frequent sight. Everywhere there are small fires and makeshift stoves and the smell of cooking. Flowers growing outside of one home. Having read so much in recent months about the society taking shape here, I wondered if books had any part to play — hence my decision to take an early morning ferry from Dover to find out. The allegation that this was “migrant tourism” is entirely fair. I won’t deny that I wasn’t extremely curious about the place. So, to ease my conscience, I decided to take as much with me as I could. The group Calais Migrant Solidarity is quite specific about what is needed — and it includes books. Celebration Song (Hamish Hamilton) by the Jamaican poet James Berry, illustrated by Louise Brierley, in which all the characters are black. By coincidence, I had just been reading Paul Harding’s Tinkers and with this lot in my backpack that’s what I felt like — a traveling tinker, out on the back roads, bumping and rattling along, hoping to spread the tiniest little bit of cheer. The trip was also a little nostalgic. The last time I had travelled to Calais as a foot passenger was in 1978 when I hitched to the Nice Jazz Festival. Cherished memories! Didn’t we all want to be Kerouac back then? The hitching didn’t work this time and I had to walk the two miles to the camp, meeting a flow of migrants en route, many cycling, though one was hobbling on crutches having broken his leg three weeks previously trying to climb beneath a train. 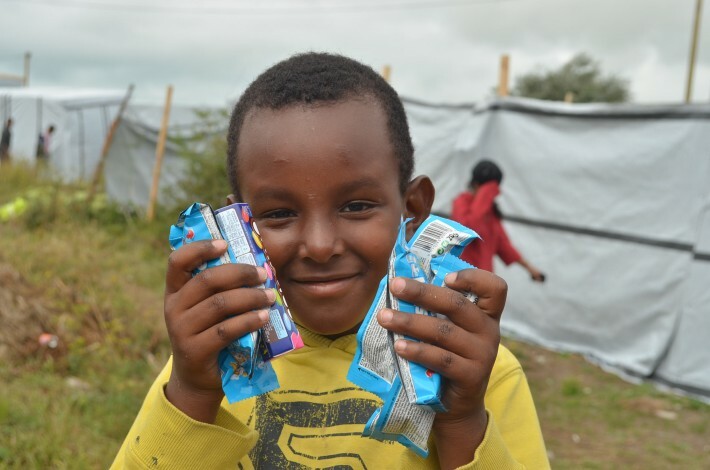 I’d love to say that six-year-old Abel from Eritrea grabbed the books and showed them to his mum but, to be honest, it was the Rice Krispie bars that interested him more. He seized the lot and beamed, and then — and this was touching — proceeded, unbidden, to share them out with all the grown-ups he was with.